Among the art you can see in the Manetti Shrem summer exhibit this weekend is Andrea Chung, Boopsie, 2008, digital collage, 10x12 in. Courtesy of the artist. Temperatures around the region are predicted to be at or near the century mark this weekend which means only one thing. It’s a great time to go to museums where one can enjoy air conditioned comfort, art and other activities. And there’s plenty to see this weekend. The Manetti Shrem’s summer exhibition featuring two women artists in separate shows opened June 30. If you haven’t seen it yet, Sunday afternoon is a great time since there’s a reception and opportunity to meet the artists. 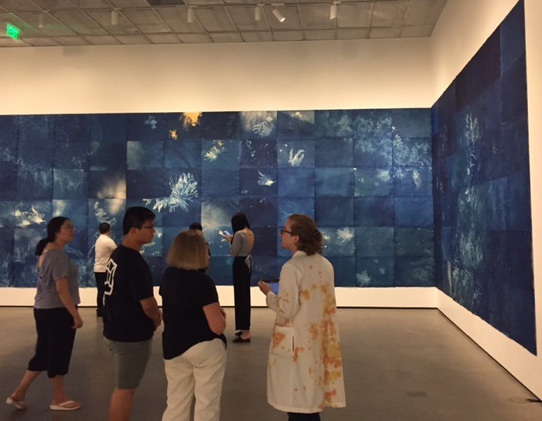 The exhibition is perfect for summer: sunny images combined with aquarium-like cyanotypes and water color. There are messages too. The reception runs from 2 to 4 p.m. and includes a talk by the artists, art activities for the whole family and refreshments. And, as usual at the Manetti Shrem, it’s all free. The museum is open 11 a.m. to 5 p.m. each day for viewing all this art (some has a summer theme) this summer. The museum is closed on Mondays. More about other UC Davis related exhibits that are ongoing, read it here. In the talk, guest curator Melissa Hyde will be joined by Lecturer of French & Honors Program at California State University, Sacramento, Vanessa Arnaud, for a thought-provoking conversation of women’s roles in 18th- century France and today. The exhibition runs through Aug. 19. At the Crocker: Jean-Baptiste Oudry, Seated Lady in a Garden, n.d. Oil on canvas, 39 3/8 x 35 7/16 in. The Horvitz Collection. "Yellow Bile," a large-scale figurative painting by Justin Marsh, a preparator at the Manetti Shrem Museum of Art, is part of his exhibition, The Four Humors at Axis Gallery in Sacramento. axisgallery.org. Through July. Verge Center for the Arts is showcasing works by UC Davis MFA students in Notebooks of a Body. Catch the Sacramento Bee's article featuring these and other Second Saturday attractions. Okay, not the coolest activity we can think of. But, there are some air-conditioned buildings, plenty of cold drinks to wash down the fried food, and there is art. All at the California State Fair at Cal Expo. After you visit all the UC Davis mommies and babies (we are talking fair animals) and the crops, honey and anything else UC Davis has on display, take in some of the art. You’ll find that throughout the exhibition buildings you’ll see photography, other visual arts and textiles in some of the "counties" exhibits. You’ll even find an art quilt by yours truly, “Elvis in Memphis” in the textiles area. Yolo County’s artists and farmlands will be front and center in the Yolo County booth. The booth's theme takes its inspiration from YoloArts Art & Ag project, an artist-to-farm visit program in its 11th year. Paintings and 3D artworks will be on display. Alongside the art will be some of Yolo County’s specialty farm products such as nuts, wine, olive oil, honey and fresh produce, many with labels that are works of art on their own. The burgeoning brewery business in Yolo County will also be featured with the display of a collection of “growlers” (glass jugs for draft beer) each with unique logo art. A large (8’ x 12’) print of an original oil painting by Phil Gross of Davis will be the artistic centerpiece of a booth featuring the artwork of 23 Yolo County artists. A native of San Francisco, Gross is a 50-year Yolo County resident. Yolo West of 89, Phil Gross, will be on display in the Yolo County exhibit at the State Fair opening this weekend. The booth features a barn replica with art on display inside, a documentary video by Gross on YoloArts’ Art & Ag Project and a video of county farmlands by local videographer Mark Jones. Artists, along with Gross and Jones, whose work will be featured in the booth are: Pat Coletti Allosso, Steve Beckley, Kenny Calhoun, Kate Childers, Danielle Collins, Matt Connors, Dee Conway, Lynne Cunningham, Trina Drotar, Rhonda Egan, Alan Fishleder, Linda S. Fitz Gibbon, Claire Haag, Laura Hanke, Sandra Jennings Jones, Diane Mohar, Philippe Plouchart, Susan Raines, Yvonne Roque, Alejandro Rubio, and Tracy J. Thomas. The State Fair runs July 13-29 at Cal Expo, Sacramento. Some of the best art writing is of course in The New York Times. And one of my favorite Sunday afternoon activities is to hang back on my patio and read The New York Times feature sections and read about all the exhibitions I probably won't go to. But, if you don’t get the Sunday edition delivered at home, and you don't have a subscription, you have to go get one. (A potentially sweltering activity). Not if you are affiliated with UC Davis…The UC Davis Library has announced an online newspaper deal as big as New York — as in The New York Times — for faculty, students, staff, researchers and clinicians on the Davis and Sacramento campuses. With an authenticated UC Davis log-in, you can obtain a free NYTimes Pass for unlimited access to most content (i.e. not just Sundays). Find out how in this Dateline story. You must have a UC Davis account to partake of this great offer. Soterios Johnson, director of Humanities, Arts and Cultural Partnerships at UC Davis, gives you what’s happening in the region this week and every week in his new blog, Capital Culture List, a public service of UC Davis. You can read it (in the blog), listen to it (on the podcast), or do both. Before coming to UC Davis, Johnson worked as a journalist for 22 years at WNYC, the NPR member station in New York City. The last 14 years of that time he was the local host of NPR’s Morning Edition. The Capital Culture List is your guide to noteworthy Arts and Culture offerings in and around Sacramento.